Fresh Voices is hosting our third speaker series on December 8th, 2017. 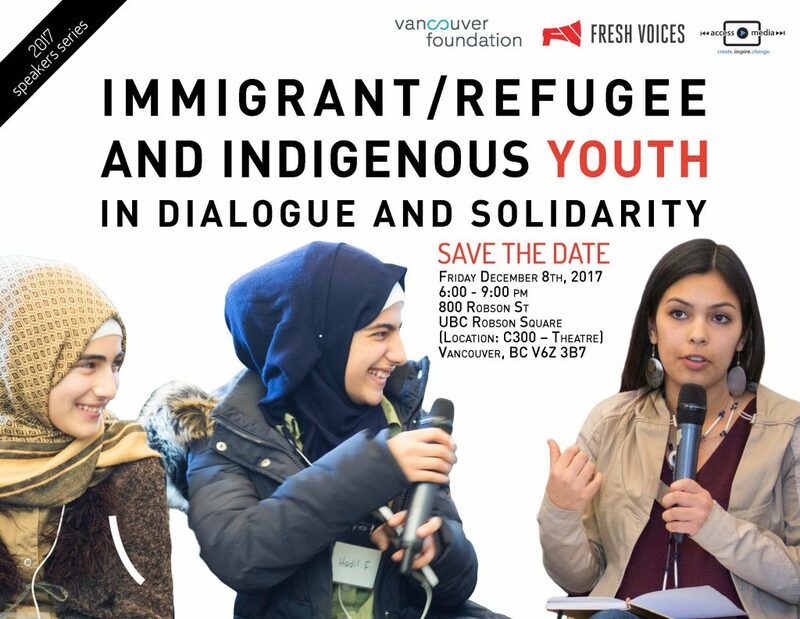 At this event we will explore how immigrant and indigenous communities can build trusting relationships of solidarity. This conversation is foundational to our work as we seek to shift how we build relationships with indigenous people and aim to a practice of decolonization while supporting the experiences and voices of refugee and immigrant communities to Canada. This fall 21 indigenous and migrant/refugee youth gathered on Galiano Island and in Vancouver to participate in the DisPLACEment program. Participants of DisPLACEment learned how to make and share videos that spark conversations about issues related to displacement, while enhancing understanding and strengthening relationships between these two communities. The videos ranging from in your face raps and spoken word reflections to poignant dramas will be premiered at this event. This event has been made possible through the leadership of many young leaders from our Fresh Voices Youth Advisory Team and indigenous youth from Turtle Island. They have guided and advised much of our work and they would like to invite you to join us celebrating their work, and contributing to conversations about the challenges and possibilities of creative collaboration and solidarity building.